For the Peppermint Chocolate Torte: Preheat the oven to 350ºF. In a large bowl, stir together the crushed cookies and butter until thoroughly combined. Remove to a 9-inch springform pan and press the mixture into the bottom of the pan. Place in the oven and bake until crispy for 10-12 minutes. Remove and allow to cool completely. For the Chocolate Fudge Sauce: In a medium sauce pan over medium heat, stir together the butter, half and half, brown sugar, and salt. Bring to a simmer, stirring occasionally until the sugars have dissolved, about 3-4 minutes. Remove from heat and stir in semi-sweet chips, bittersweet chips and vanilla extract. Allow to cool completely, about 10 minutes. 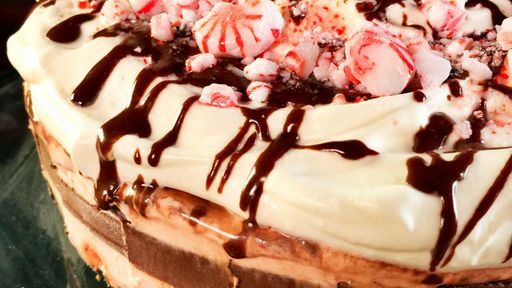 Once crust and fudge have cooled, spread half of the softened pink peppermint ice cream on top of the cookie crust, evening out the top with an offset spatula. Pour over 3/4 fudge and spread evenly. Place in freezer for at least 30 minutes. Remove from freezer and top with remaining softened pink peppermint ice cream. Freeze for at least 1 hour or overnight. To serve: Remove the torte from the freezer once more and top with a fluffy pile of whipped cream. Drizzle the remaining amount of chocolate fudge sauce over the top of the whipped cream. Sprinkle crushed peppermints on top to finish. Slice into wedges and serve immediately or hold in the freezer until ready to serve. For the Topping: In the bowl of a stand mixer fitted with a whisk attachment, add the heavy cream and beat on medium until soft peaks form. Add the confectioner’s sugar and vanilla extract and continue to beat until medium peaks form. Tip: Get creative! Use this recipe as a base and try this torte with your favorite ice cream flavors!